The story of the day has been Jerome Powell’s confirmation proceedings as the next Chairman of the U.S. Federal Reserve (FED). Most major news agencies are reporting that he will likely receive bipartisan support, guaranteeing a smooth approval. Barring any earth-shattering developments, all Powell has to do is address any follow-up inquiries and go in front of the full U.S. Senate. Big banks are not “too big to fail” in the contemporary financial environment. All in all, it looks as though Powell will be friendly in regards to further deregulation of Wall Street. If coupled with a successful passage of the Trump tax plan, the bull market in U.S. equities may continue for quite some time. After scanning the minutes of Powell’s confirmation hearing, it is no wonder that the USD continues to gain ground against the EUR. In my opinion, the smooth nature of the exchange is a bit of a surprise to the markets, with Powell being a Trump nominee. Typically, any moves by Trump are met with resistance and extreme scrutiny. This one certainly has not. Currently, the EUR/USD is trading at robust support, right at the 38% retracement of the current bull run. In the event that this level holds, the buy signal facing this instrument will remain alive. 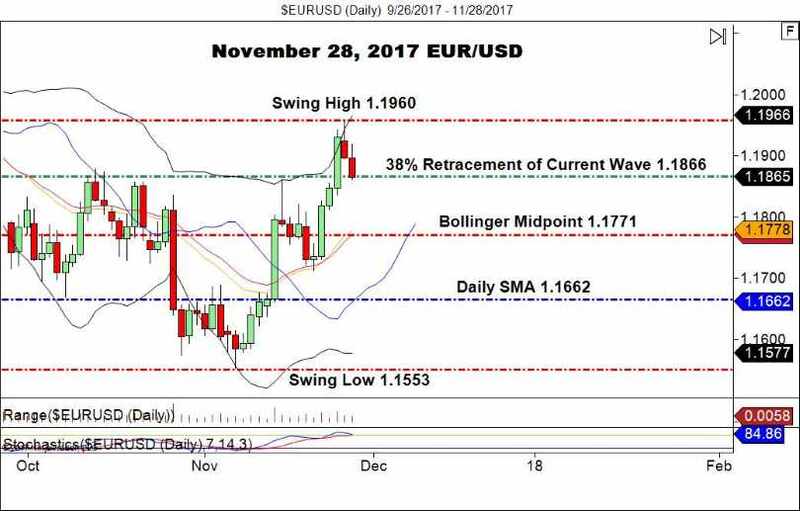 As we move forward this week, I will be looking for more opportunities in the EUR/USD. The divergence between the Bollinger MP and Daily SMA are an indication of a live market. We will have a fresh set of support and resistance levels for the coming sessions. If you are holding open positions around these releases, be sure to have risk and reward properly aligned. Stay tuned to FX Leaders for breaking news and analysis throughout the coming forex trading day.